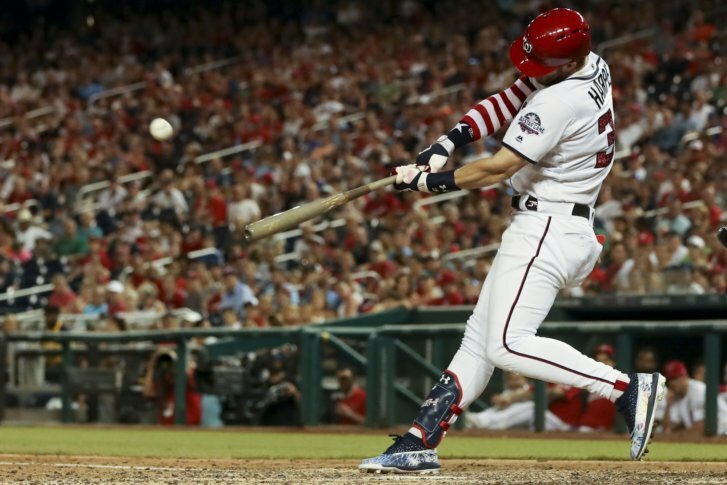 Three Washington Nationals were announced as MLB All-Stars on Sunday night, and a fourth player could possibly join them. Manny Machado is the lone Oriole to make the short trip to Nats Park for the July 17 exhibition. Bryce Harper was named as one of the three starting outfielders for the National League All-Star Team. This is fourth straight year that Harper has made the starting line up for the NL. He’s been an All-Star in six of his seven seasons in the majors. WASHINGTON — Three Washington Nationals and one Baltimore Oriole have been selected to play in the Major League Baseball All-Star Game on July 17. Bryce Harper, Max Scherzer and Sean Doolittle will represent the Nationals on the National League team in the Midsummer Classic at Nats Park, the first MLB All-Star Game in Washington D.C. since 1969. In the American League, Manny Machado is the lone Oriole to make the team. 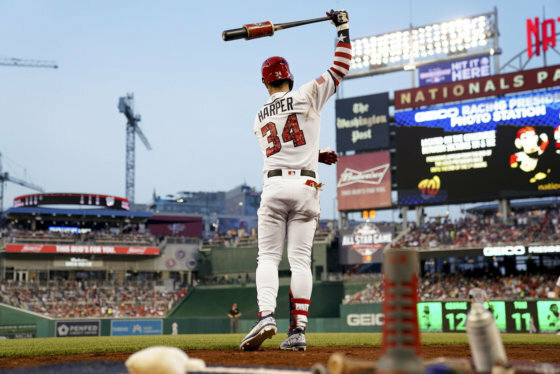 Harper was voted one of three starting National League outfielders for the fourth consecutive season, and National-record sixth time in his seven-year career. Through Sunday, Harper led the Nats with 50 RBI, and his 21 home runs are third-most in the National League. Harper will also participate in the Home Run Derby on July 16. Scherzer makes his sixth straight All-Star Game, including all four seasons he’s been with the Nationals. Scherzer is 11-5 with a 2.33 ERA in 19 starts this season, leading the National League in strikeouts (177), strikeouts per 9.0 IP (12.48), WHIP (0.89) and opponents batting average (.179). Scherzer, the two-time reigning NL Cy Young Award-winner, is considered the favorite to start the All-Star Game for the NL, and Dodgers manager Dave Roberts hinted at it on ESPN’s All-Star Selection Show. Doolittle makes his first All-Star appearance as a National, and first since 2014 with the Oakland A’s. Doolittle’s 22 saves rank fourth in the National League, and he leads NL relievers in save percentage (95.7), strikeout-to-walk ratio (16.33), WHIP (0.54) and OBP (.167). On Friday, Doolittle set a Major League record by making his 29th straight appearance with at least 1.0 inning pitched without issuing a walk. A fourth National, shortstop Trea Turner, could make the team via the “Final Vote” contest. Turner is hitting .278 with 11 home runs, 37 RBI and 54 runs scored this season. Turner’s 22 stolen bases rank tied for third in the NL, and his 3.2 WAR leads NL shortstops. Despite Baltimore’s Major League-worst 24-65 record, Machado was voted as the starting shortstop for the American League, his first selection at that position after three previous All-Star appearances at third base. Machado’s batting average (.313) ranks fifth in the AL, and he also leads Baltimore in OBP (.382), home runs (21), RBI (60) and hits (106). Machado joins Cal Ripken Jr. as the only other Oriole to start the All-Star Game at both shortstop and third base.